There have been so many magical moments at Camden Yards in the last 24 hours, with the Orioles taking a 2-0 lead over the Detroit Tigers in the American League Divisional Series. 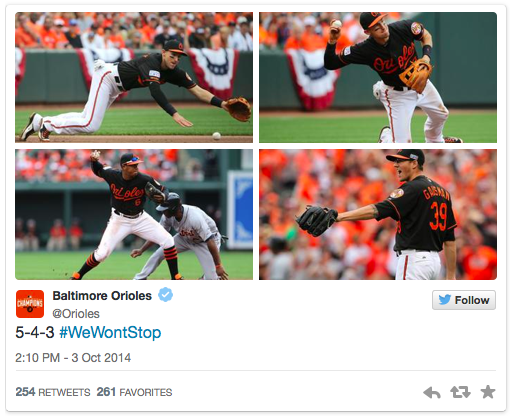 This double play in today’s fifth inning, for instance, was just unbelievable (well, not for die-hard O’s fans). But it was this call by Orioles’ announcer Joe Angel on WBAL Radio, with the Orioles down 6-4 in the bottom of the 8th inning, that sums up everything magical about this season. This is a wonderful time to be an O’s fan, but just as importantly, this is a wonderful time to be a baseball fan. Good luck in Detroit, O’s. May you muster the strength and magic to sweep the Tigers with a win on Sunday!